I’ve never been much of a master at wearing or doing my makeup. Throughout 2016 I went through a stage where I was willing and trying out many makeup brands which I’d have probably never heard of if i hadn’t been so into new emerging brands(for me at least). Being an oily darker skinned girl, it can be very difficult to finding the perfect foundation and concealer to help combat some of my daily makeup woos. I found some amazing brands and products which has really helped me enjoy wearing and trying to up my makeup game. In my earlier post (here), i shared with you my thoughts on that money-saving eyeshadow palette. 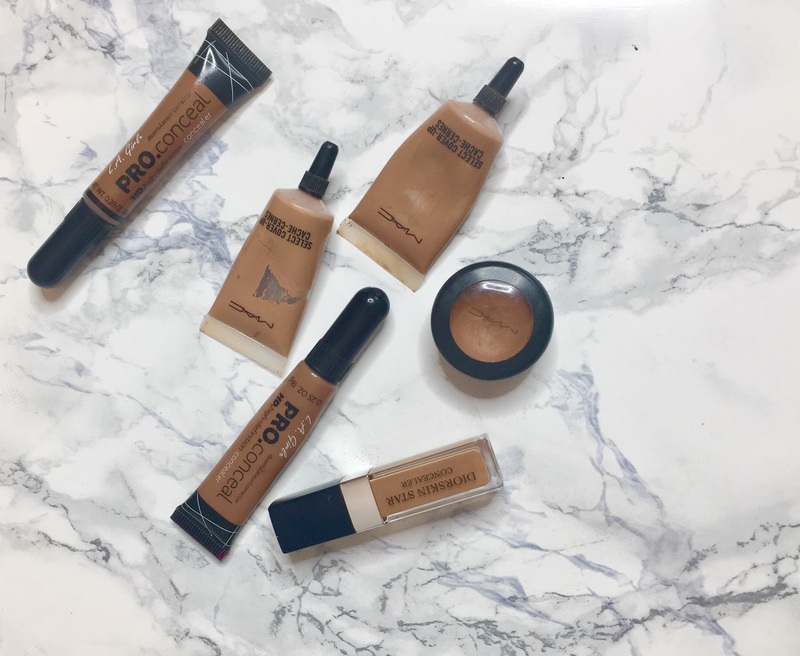 Today I though I’d share with you my run-down of some concealers which has really helped me to cover up some of my skincare secrets. It is very hard to narrow down my most favourite concealers of 2016, but if I was to pick my most used product it would be the LA Girl Pro Concealer – Chestnut and Toast | This concealer is very inexpensive, durable and can be built up for a full coverage makeup look or a natural everyday glam look. Its content will cover all your skincare woos. I rediscovered my love for M.A.C products again (at least the concealers), and the Diorskin Star Foundation and concealer are the one that I’ve repurchased again because I have finally discovered how to use them. Although the Dior Star Foundation were not a favourite of mine when i bought it a while back but I ran out of my trusted shade 12 Lancome Teint Idole Foundation so i had to use it, they are a new addition to my makeup routine. M.A.C select cover up; NW40 + NW45 – Studio Finish Concealer in NW45, Dior Star Concealer in 003, are my favourites and I have worn them non-stop last year. What concealers have you been loving lately?